Unlike most team sports, baseball games have no time limit. They can become even longer when the weather doesn't cooperate. Rain delays in professional baseball, including the major leagues, and many amateur leagues, are governed by the official rules of baseball. These rules dictate who can call rain delay and when. Prior to the start of the game, only the manager of the home team can decide whether or not to delay the start of the game due to the weather. There is an exception to this rule. Before the start of the second game in a double-header, the umpire-in-chief of the first game has sole discretion over delaying the start of the second game. The league president can make the final call in "the closing weeks of its championship season." This is to prevent managers from taking advantage of the rule when a game has to be played. The point is to make sure the championship is decided on the field. As soon as the home team hands in its batting order, the umpire-in-chief assumes control of the game. From that point on, only he can call for a delay or a suspension due to weather conditions. An umpire can make that call as many times as necessary, so there are no limits to how many rain delays you can have in any one game. The game resumes as soon as the umpire determines the playing conditions are safe. If that doesn't happen, the umpire can call the game, but he does have to wait at least 30 minutes from the time play stopped. 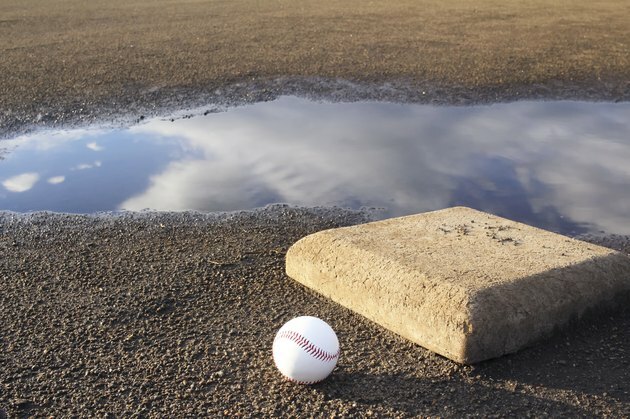 Rain delays can last for minutes or hours. In June, 2013, for instance, the Tampa Bay Rays and the Cleveland Indians played a game with almost five hours of rain delays. The umpire can suspend play as long as there's "any chance to resume play."